"It means no worries for the rest of your days. It's our problem-free, philosophy. Hakuna Matata!" Stone Town is the perfect start to your Zanzibar Island adventure. As the birthplace of Freddie Mercury, this cultural melting pot may be a tiny town but it sure does pack a big punch. An experience that truly felt like taking a magic carpet ride, this dazzling place took us to a Whole New World (how many Aladdin references do you think I can squeeze in here?) After waking up feeling like Princess Jasmin at the Forodhani Park Hotel, take a stroll over to Zanzibar Coffee House to admire the architecture and indulge in delicious sweets and savory treats before heading into the Darajani Market. Next, make your way over to lunch at the Rooftop Tea House, Emerson on Hurumzi Hotel for unbelievable sights and indescribable feelings (omg sorry you guys!). With no one to tell you no, or where to go, I think it may be time to shop for some shining, shimmering splendid souvenirs (THAT WAS THE LAST ONE I SWEAR). Finally make your way to Africa House Hotel for a sundowner to remember before dinner at the Forodhani Gardens. Cap it all off out on the balcony of the Taperia where you can enjoy a couple cold Kilis while desperately trying to get Jambo Jambo out of your head. Grab a table outside at Taperia for a bucket of beers or a signature cocktail before calling it a night. Heads up, this place can turn into quite the party scene so don’t wait too long before heading over. And if your second stomach kicks in around this time like mine does, no worries, Taperia has a great menu! They also feature live music on the weekends. All around, a wonderful ending to a magical day in Stone Town! Ahhh yes. Dinner time. My second most favorite time of the day. The night market at Forodhani Gardens takes place every evening from 6-9pm. Tables overflowing with delicious Zanzibar fare such as Zanzibar pizza (taste nothing like pizza but it’s delicious, we promise), fresh seafood, and every type of meat on a stick you could dream of. Take a stroll around and get acclimated before hitting up the stalls that called out to you and wash it all down with some freshly squeezed sugar cane juice (no alcohol here guys). Our tip here is to stick to the busy stalls, it helps ensure the freshness of the seafood and meat, and confirm the price before you purchase! We unfortunately learned the hard way. And of course, bon appetit! So if you decided to on The Rooftop Tea House for dinner, you will most likely be enjoying your sundowner there; but if you decided to go local and eat at the Forodhani Gardens, we recommend Africa House Hotel for your sundowner. Make sure to show up around 5:30pm to grab a good spot as the sun usually sets around 6:30pm in Zanzibar. Mother Nature puts on a magnificent show and you won’t want to miss it. But if you weren’t able to grab a spot, you can always head down to the Forodhani Gardens sea front and walk around as they set up the night market where you will have first row tickets to this incredible sunset over the Arabian sea. And bonus points, you will most likely see another show while the sun is setting as locals gather here to wash away the heat of the day with dare devil aerobic dives into the sea. Hey Sister! Good Price Just For You! I dare you to walk through these charming streets, vendors calling at you left and right, and leave empty handed. If anything, grab a pair of alibaba pants for the beach! The streets of Stone Town are jam packed with vendors and vibrant storefronts with endless options. You will hear the same swahili phrases like Hakuna Mata, and you will undoubtly become everyone’s favorite sister, but try to take it all in and enjoy the experience. Just don’t buy the first pair you see! Shop around, I promise you’ll find the exact same pair a few stores down the road. And use those bargaining skills. Because who doesn’t like a good deal? PS. Make sure to walk through the Old Fort on your way to your next experience! So here’s the deal. You have two options. In our guide we are recommending lunch at the Rooftop Tea House because we loved having dinner at the Forodhani Gardens, but you can of course book a table (reservations required) for the five course dinner as well (and make sure to show up earlier for an unforgettable sun downer). You won’t be disappointed either way. After walking up the beautifully narrow stairwell, your efforts will be rewarded by the jaw dropping setting of this magical restaurant. This Persian (whoo hoo!) inspired restaurant is adorned with floor cushions under a delicate silk canopy. Shoes are removed before entering and hands are washed table side in rose water (I mean, does it get any more luxurious than this?). Listen to the call of prayer while sipping a delicious cocktail over the endless colorful sea of Stone Town below you. It’s worth the splurge! Pst. If you feel up for it, make your way north to see The Old Dispensary after visiting the market! Second Breakfast. And Coffee. And a Snack. Why Not? I usually am not one to pass up a free hotel breakfast, but since it’s my favorite meal, I also hate giving up a chance to explore a new restaurant. That’s where Zanzibar Coffee House comes in. With it’s locally grown coffee beans and wonderful staff, you can find something to satisfy any craving (seriously! ), not to mention the delicious coffee. You can even grab a beautiful souvenir tin of coffee for home. This beautiful space is decorated in traditional Zanzibar charm, and is the perfect spot to caffeine up before the Darajani Market. And bonus! They just opened up their rooftop cafe open from 11:00-3:00pm daily! Yay coffee!! 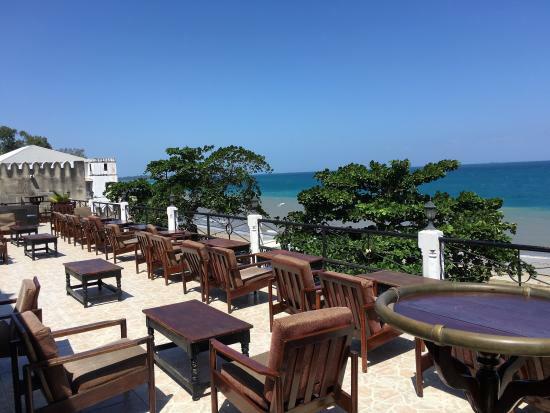 Hotel recommendations aren’t usually our thing (typically because we have a low lodging budget), but after we were rebooked at the Forodhani Park Hotel (our original hotel ran out room) we couldn’t have a Stone Town guide without including it! What’s not to love about this place? You can walk there from the Ferry Terminal (which heads up, is a bit chaotic), it’s right next door to the Forodhani Gardens, and the rooms make you feel like you are an Arabian Princess (or Prince). And did we mention the rooftop pool? With 19 beautiful rooms to pick from (with breakfast included), it’s the perfect retreat for your stay in Stone Town. A tiny town with a big punch, Stone Town is the perfect start to your Zanzibar Island adventure. An experience that truly felt like taking a magic carpet ride, this dazzling place took us to a Whole New World (how many Aladdin references do you think I can squeeze in here?) After waking up feeling like Princess Jasmin at the Forodhani Park Hotel, take a stroll over to Zanzibar Coffee House to admire the architecture and indulge in delicious sweets and savory treats before heading into the Darajani Market. Next, make your way over to lunch at the Rooftop Tea House, Emerson on Hurumzi Hotel for unbelievable sights and indescribable feelings (omg sorry you guys!). With no one to tell you no, or where to go, I think it may be time to shop for some shining, shimmering splendid souvenirs (THAT WAS THE LAST ONE I SWEAR). Finally let yourself get lost while shopping for souvenirs through the tiny, curvy streets of Stone Town on your way to dinner at the Forodhani Gardens before ending the night with a beautiful sunset at Africa House Hotel. Cap it all off out on the balcony of the Taperia where you can enjoy a couple cold Kilis while desperately trying to get Jambo Jambo out of your head.